The Presidential Award of Certificate of Honour to Sanskrit, Pali, Prakrit, Arabic, Persian, Classical Oriya, Classical Kannada, Classical Telugu and Classical Malayalam scholars for the year 2018. 1. Ministry of Human Resource Development (M/HRD) has invited recommendations/nominations for Presidential Award of Certificates of Honours to distinguished scholars of Languages mentioned above. 2. The Scheme for the Award of the Certificates of Honours was introduced in the year 1958 to honour the scholars of Sanskrit, Arabic and Persian languages and extended to cover Classical Oriya, Classical Kannada, Classical Telugu and Classical Malayalam from the year 2016. Under this Scheme, a Certificate of Honour along with a onetime monetary grant of Rs.5,00,000/- each is awarded to Scholars of eminence over 60 years of age with outstanding contribution in the field of each of these languages. 3. The scheme also provides for one International Award of Certificate of Honour to a Non-resident Indian or person of non-Indian origin with outstanding contributions in the field of Sanskrit and Two International Awards (one each for person of Indian and Non-Indian Origin) in each of the languages of Classical Oriya, Classical Kannada, Classical Telugu and Classical Malayalam. 1. The Department of Health Research, Ministry of Health and Family Welfare, Government of India is administering a Scheme for ‘Human Resource Development for Health Research’ (HRD Scheme) which is intended to create a pool of talented health research personnel in the country by upgrading skills of faculty of medical colleges by specialized training in priority areas of health research. The scheme also has a separate component specifically for emerging young scientists and Non-resident Indians (NRIs), Persons of Indian Origin (PIO), Overseas Citizen of India (OCI) serving abroad in health research activities so that they can come back to India for undertaking research in identified areas. 2. As part of the Scheme, Non-Resident Indians, will be provided Stipend/ Salary and Rs. 1 Crore grant for 5 years. This Scheme provides an opportunity for these persons/ Faculty to return to India and pursue research in any Institute across India. 3. The priority areas of research identified for the Scheme include Toxicology, Genomics, Proteomics, Geriatrics, Stem Cell Research, Clinical Trials, Good Clinical Practices (GCP), Biotechnology, Genetics, Operational Research, Health Informatics, Medical Ethics, Health Economics and any other area that needs support as per National Health Policy. 4. The detailed guidelines regarding eligibility criteria, financial components including the formats of application are available on www.dhr.gov.in. For further details, Dr. Kavitha Rajsekar, Scientist-D, email id kavitha.rajsekar@nic.in, may be contacted. The General Scholarship Scheme (GSS) is one of the most important and popular schemes of the ICCR for foreign students. Scholarships are awarded under this scheme annually to international students belonging to certain Asian, African, European and Latin American countries for the undergraduate, postgraduate degrees and for pursuing research at Indian universities. However, scholarships for medical studies for MBBS, BDS or for medical research leading to a PhD degree are not offered under the GSS scheme. Scholarship Programme for Diaspora Children (SPDC) for the academic year 2017-18 is going to be launched on 17th July, 2017. The online portal for the scheme is spdcindia.gov.in. The last date of submission of applications online is 30.09.2017. 3. Of 150 scholarships under SPDC, 50 are reserved for category (c) and (d) above. · Both parents should be registered in the Mission/Post in Nepal for a minimum period of four years. · The applicant has done at least four years schooling including two years of classes XI & XII in Nepal just prior to application. II. Children of PIO/OCI/NRI who have not passed the qualifying examination (12th) from a foreign country except in the case of children of ECR country workers (category d above), are not eligible for SPDC. III. Cut-off date to decide the NRI status is last date of the preceding financial year i.e. 31.03.2017. IV. Applicants should attach the conversion scale so that grade achieved in qualifying exam (Grade 12th) could be converted into percentage of marks achieved, wherever required. V. For income proof, in addition to the salary certificate from the employer, an undertaking that total monthly income of both the parents does not exceed US$ 4000 should also be uploaded in the SPDC portal. 5. For more details, please read the attached document. As bolsas, destinadas a estudantes internacionais, são promovidas pelo Kendriya Hindi Sansthan, um organismo autónomo que atua nas área da Educação e Ensino Superior, com o apoio do Governo da República da índia. Para informação detalhada, consulte http://www.letras.ulisboa.pt/pt/noticias/839-bolsas-kendriya-hindi-sansthan-candidaturas-abertas. 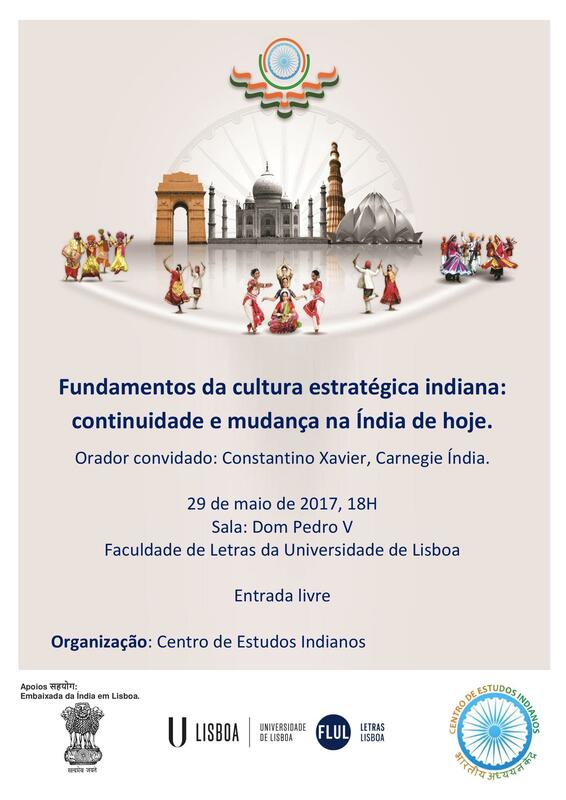 Orador convidado: Constantino Xavier, Carnegie índia. Quais são os fundamentos da cultura estratégica indiana: refletem a sua ancestral cultura védica ou os valores coloniais da era britânica? Como encaram os indianos a utilização da força militar para princípios como a auto-defesa ou fins expansionistas? Como negoceiam os diplomatas indianos em foros internacionais para realizar os interesses nacionais? Como aborda Nova Deli o relativo declínio do Ocidente e a formidável emergência da China na ordem internacional? Como é que a natureza democrática do governo indiano afecta as suas relações com outros países quando estão em causa valores como os direitos humanos? E, por fim, que mudanças trouxe o novo Primeiro-ministro, Narendra Modi, no poder desde 2014? Abordando estas questões, a palestra visa analisar os princípios fundamentais da cultura estratégica indiana, identificando dinâmicas de continuidade e mudança. Subject: Announcement for inviting applications meant for the Indians as well as Overseas Nationals having Master's degree in Agriculture and Allied Sciences for the Netaji Subhas- ICAR International Fellowship for the year 2017-18. Department of Agricultural Research and Education, Ministry of Agriculture that council for Agriculture Research (ICAR) invites application from Indian as well as overseas nationals having Master's Degree in Agriculture and Allied Sciences for the 'Netaji Subhas- ICAR International Fellowship (ICAR-IFs)' for the year 2017-18. The ICAR-IFs are available for pursuing doctoral degree in agriculture and allied sciences, in the identified priority areas to the (i) Indian candidates for study abroad in the identified overseas universities/lnstitutions having strong research and teaching capabilities and (ii) to overseas candidates for study in the best Indian Agricultural Universities (AUS) in the ICAR-AUs Systems. Thirty Fellowships for duration of three years will be available. Notification of announcement of ICAR International Fellowship for the year 2017-18 details of guidelines, priority area of study and application proforma are available on ICAR website www.icar.org.in. A copy of the "Notification and Guidelines" is also enclosed. Last date for receiving the application in the ICAR is June 15, 2017.